My baby girl, though no longer a baby, has graduated to the first grade. Amelia had a fantastic year in kindergarten. She’s made some friends and her teacher loves her. And, I can’t help but brag as a proud parent, we learned that Amelia is advanced in reading, math, comprehension, and in maturity. We know this doesn’t necessarily mean Amelia is going to be taking AP courses when she’s in high school, but it’s nice to know that, so far, Greg and I are doing this parenting thing right. This past weekend I got my first tattoo. I was going to get one last year, but then we learned I was pregnant and Greg was all “oh, hell no!” and stuff. I was hoping to be able to use the actual foot prints of the girls (the ones we received from the hospital), but Greg wasn’t able to find them in time. So, I conceptualized and the tattoo man and I came up with the above design. Not bad for $50, huh. It’s good to know people. The whole process wasn’t as painful as I was expecting, but it wasn’t as painless either. I had the tattoo done on my chest, on the left side — right where you place your hand when you say the pledge of allegiance. 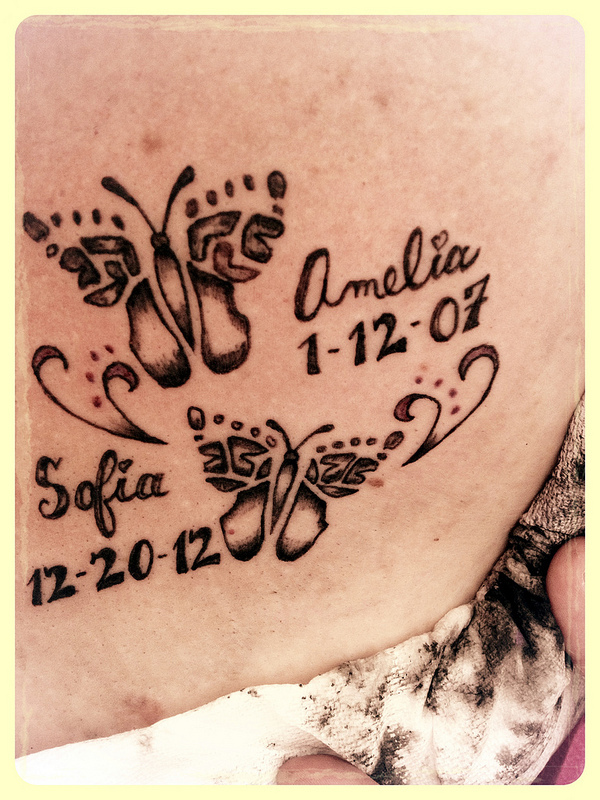 Amelia was with me when I had the tattoo done and she loves it. The tattoo felt like a sunburn up until Tuesday. Now, it’s in the peeling phase. Thankfully, it doesn’t itch… yet, but I hear that’s next. Do I want to get another tattoo? Not yet. Also, I have want I want design wise and I can’t think of anything else I’d like done. I video taped Amelia reading her ‘Big Sister’ shirt. You can see how short her attention span is. However, Amelia truly understood what was going on when I explained that ‘there’s a baby growing in my tummy’. And since that day, Amelia has been so excited to know that she’s going to be a big sister.